Go to Roper male-line Y-chromosome project web page. 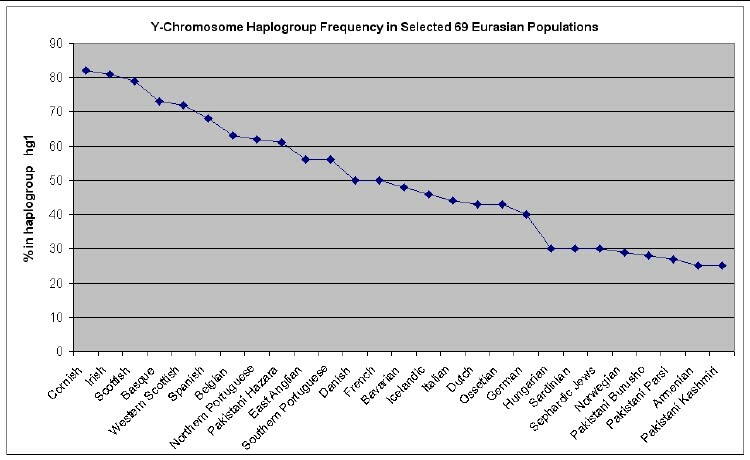 The paper also shows that Irish and Welsh women (from mtDNA tests) do not predominately originate from the paleolithic, but instead from the neolithic people who migrated in later from the east. 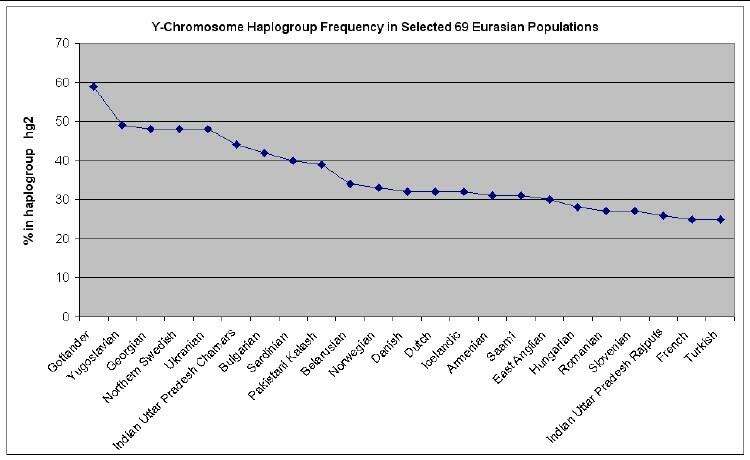 Anyone who wishes to do so can easily calculate the relative mutations for a given family name to see if that family is in one of these 7 haplogroups and then look at the graphs above to see what Euroasian populations are most prevalent for the relevant haplogroup. 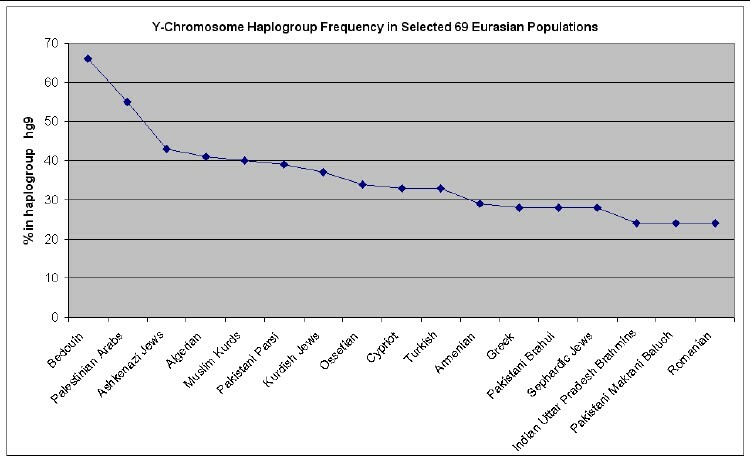 With the criterion of being within 1 relative mutation to be in a haplogroup, many of these families are not in any of these 7 haplogroups. 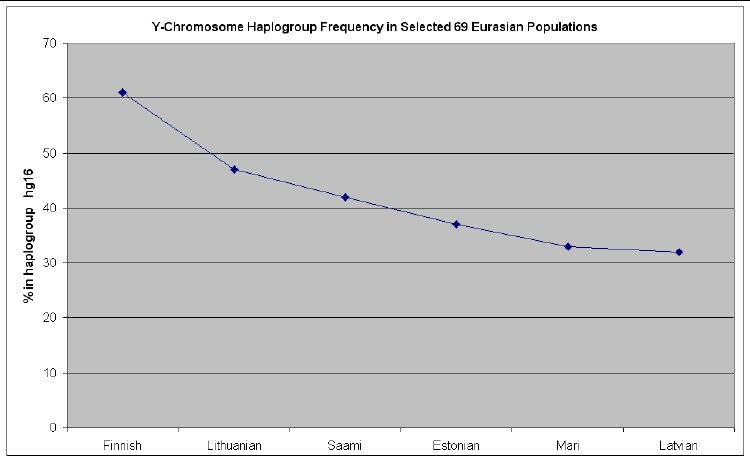 I welcome receiving more Cohen-haplogroup families to include in this calculation. 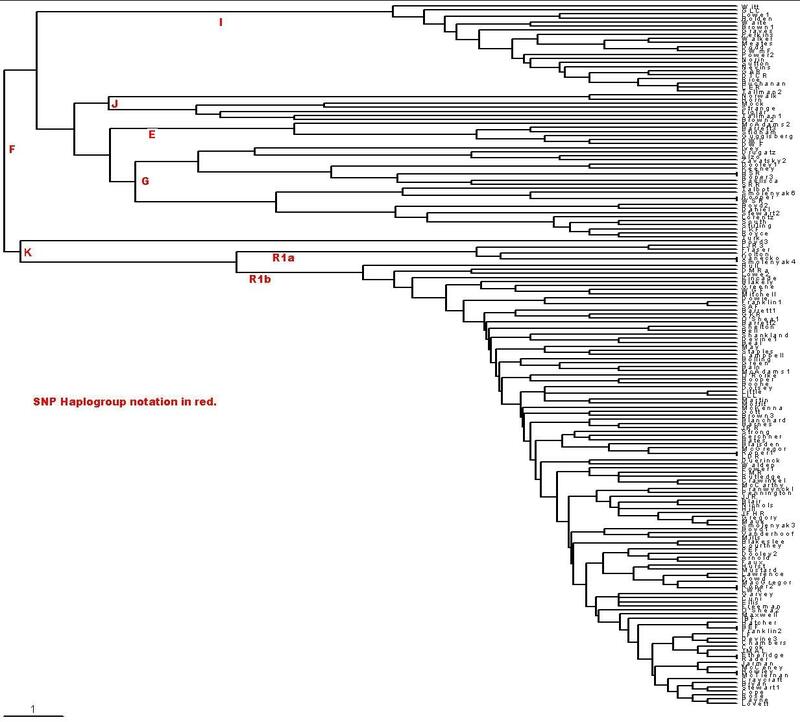 Comparing haplogroup assignments with the time-ordered phylogram (rooted tree) for the families shown below leads me to conclude that the haplogroups as defined above are not a very accurate way to categorize families. 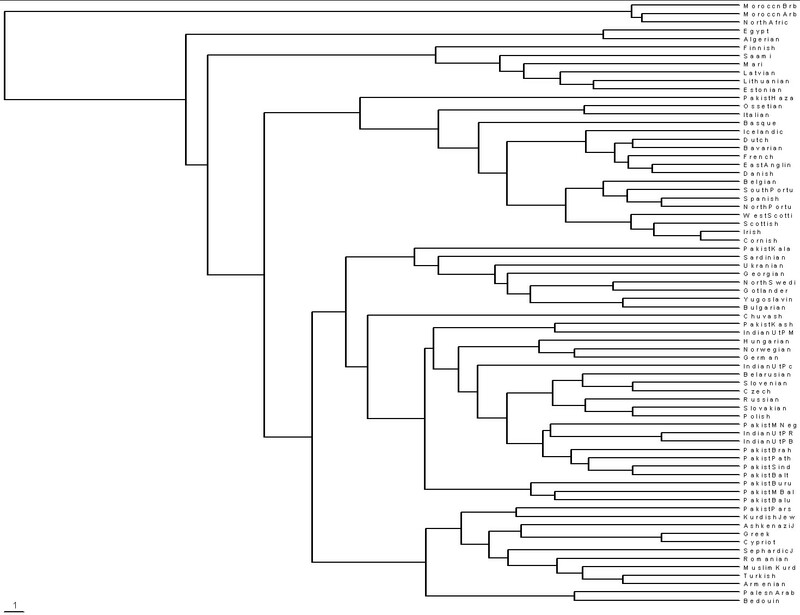 [To create time-ordered phylograms, I use the PHYLIP/Kitsch software using the relative-mutations matrix to generate a tree file (*.tre) to be plotted by the TreeView software. (For a description of how I do it, see PHYLIPTreeViewUse.htm.)] 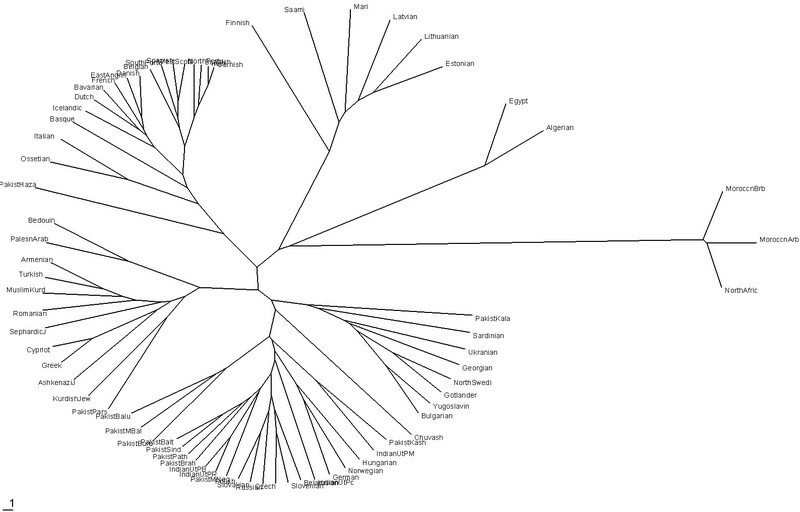 Some families that obviously closely related in the phylogram are not all in the same haplogroup in the table above. I used only the first 21 of the 25 markers for these 142 families because of some uncertainties about how to include the four DYS464 markers. The scale at the bottom left indicates the horizontal distance for 1 relative mutation. For 21 markers and 25 years per generation 1 relative mutation is about 600 years. If you cannot read the surnames on the right, right-click on the plot and save it to a file. 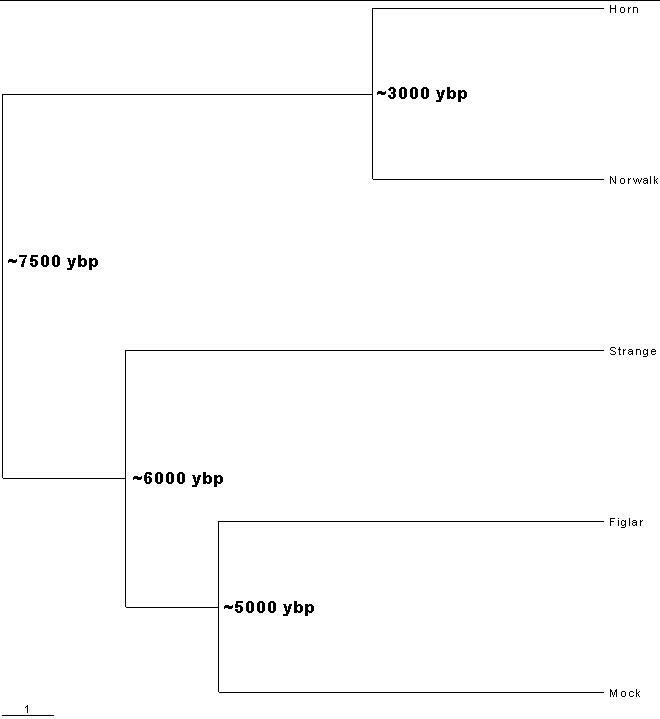 There is a large genetic gap between the "older" families (Drugatz and the families shown above Drugatz) and the "newer" families (Roper3 and the families shown below Roper3), and the older families are generally more genetically distant from each other than are the newer families. 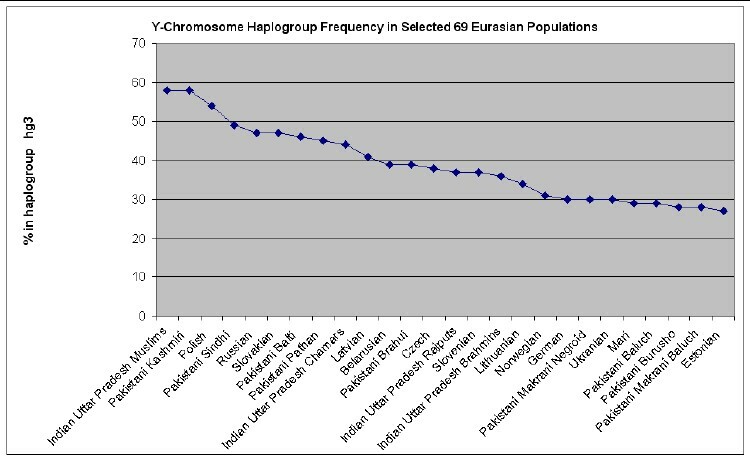 Some major event in Europe must have caused this genetic difference between the older and the newer families. A rough calculation gives the event at about 5000-6000 ybp. The event that separated all of these families from families outside of Europe occurred about 8000-10,000 ybp. (This is perhaps the Atlantic glacial flood that occurred at about that time.) I call the Drugatz and above families the older group and the Roper3 and below families the newer group; that is, the newer group evolved from a cohort family of the older group. One could argue that the newer group people are the paleolithic people that came to Europe about 30,000 ybp and the older group are the so-called neolithic people that came to Europe about 7,000 ybp. I use the terms "paleolithic" and "neolithic" with that assumption. Note that the terms "newer" and "older" refer to genetic age, not immigrant age. The newer group (22%) came to Europe before the older group (78%). 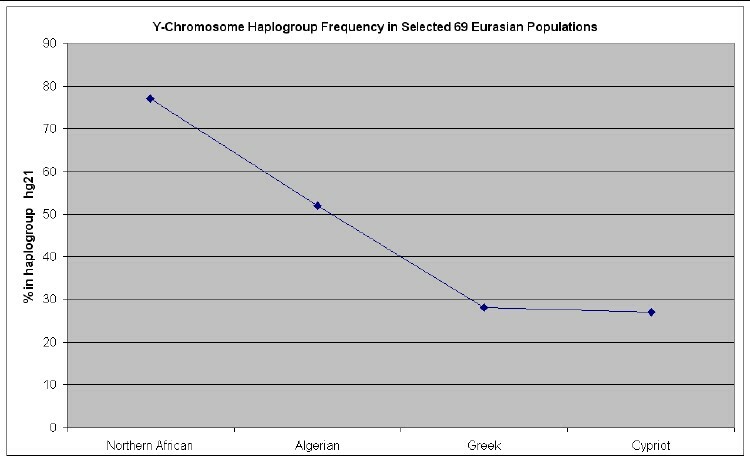 If the Scotts/Irish/Cornish separation from the other European populations occurred c8200 ybp (filling of English Channel), then the extreme left edge is about 60,000 ybp, which is consistent with the time Homo sapiens sapiens left Africa for Eurasia. This plot neatly shows the population groups according to age starting at the extreme right.